Not every kid grows up to confront the incarnation of his childhood nightmares — but that’s exactly what I got to do at this Friday’s Tribeca Film Festival Drive-In screening of the 1988 Tom Hanks classic, Big. You see, I was on tap to interview Zoltar (for the uninitiated, he’s the card-dispensing, wish-granting carnival mannequin from the film). And my memories of the guy were that he was trapped in a box (possibly because he was too dangerous to unleash on the public), had scary red eyes, and his mouth opened with a frightening breathing sound as he silently demanded you make your wish for a quarter. That’s pretty scary stuff for a 7-year-old kid to witness! I swallowed my fear, tenuously made my way to the Zoltar tent and stepped in to face one of my most crippling childhood fears. I was immediately frightened to see that the box that held him captive in the movie was nowhere to be found. 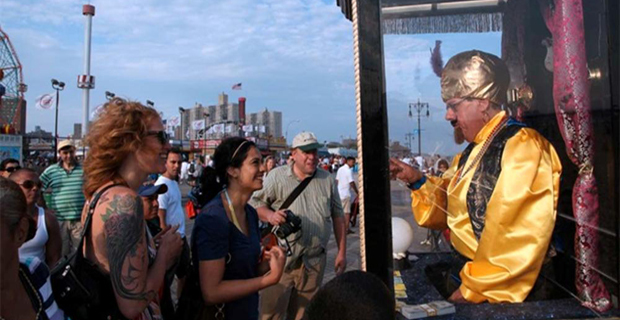 The Tribeca Film Festival had done the unthinkable, letting Zoltar out of his cage to run amok among the unwitting public. Madness! The show, however, must go on. So on I forged with my trusty camerawoman. I was immediately calmed by a quick wink and a smile from ole Zolie, who really seems to have mellowed out in his later years. He explained to me that the box had been malfunctioning in recent weeks and the risk of causing injury to his fans was too great to take, and so he had sent it away to be fixed. That’s not something an evil being would do, so I figured he must be an okay guy and launched into our interview. Surprisingly, Zoltar didn’t want to focus too much on the movie in our conversation. He only mentioned that he didn’t like the way he was portrayed by (he claims) actor Tom Cruise, and wished that William Shatner could have played the part instead. He did mention that Tom Hanks was a very nice person, and he really handled being turned into an adult very very graciously. Zoltar did regret not being able to turn him back into a child when filming concluded, but felt proud that Hanks’ career had taken off after the film. What I really wanted to find out was what made Zoltar still do this in his old age. After all, I assumed he was retired because no one had really seen him since the movie. As it turned out he had been retired, until the IRS came calling. In a cash business like fortunetelling, it’s not always easy to keep the books correctly. Back taxes have forced the great fortuneteller to dust off his turban and come back to work. What else is a fortune teller going to do for a living? It is the only thing Zoltar hasÂ ever known how to do. If growing up your great grandfather, grandfather and father were carpenters, you’d have a pretty good chance at being a carpenter. As Zoltar said, his family lineage wouldn’t allow for him to be “Zoltar the Alright”; he had to be magnificent! I asked Zoltar how many wishes he’d granted that day. After all, that’s what the man is famous for. He told me he’d made 52 children “big” throughout the day, but was including a 15 year clause to maximize the success of his wish grants. “Think of the credit I’ll get!” he exclaimed. I couldn’t help but ask Zoltar to make a couple of predictions for us.Â I immediately put him on the spot and asked him how the Yankees were going to do this season. He said that the Bronx Bombers would do very well, but it was the New York Mets that would be most successful early on in the year. Unfortunately for Mets fans, he said the Mets would end up “choking” at the end of the year. Not to question the word of the mighty Zoltar, but I could have told him that.